While the vast majority of jurisdictions in the US have the guidance of mandatory workers' compensation medical fee schedules, New Jersey remains one of the very few with no such structure. As I reported earlier, this generates multiple issues in the claims process and creates costly delays in the adjudication of disputes. Presently, New Jersey sets-forth valuation of medical fees by statute. "All fees and other charges for such physicians' and surgeons' treatment and hospital treatment shall be reasonable and based upon the usual fees and charges which prevail in the same community for similar physicians', surgeons' and hospital services." NJSA 34:15-15. Medical expenses in contested workers’ compensation cases have long been a significant and troublesome issue resulting in uncertainty, delay, and potential future liability. This issue has been more focused since the NJ Supreme Court decision, University of Mass. Memorial Hospital v. Christodoulou, 180 N.J. 334 (2004). The Court granted the NJ Division of Workers' Compensation exclusive jurisdiction of such disputes. It left open procedural guidelines on how to adjudicate the valuation of medical fees that were conditionally paid or paid in error. Currently, there is no exclusively defined procedural guidance to determine the valuation, allocation, apportionment of primary responsibility for unauthorized medical expenses and reimbursement. Justice Albin stated, "We find that the rule adopted by the Appellate Division that a medical provider may not maintain a collection action in the Law Division against an employee who has a pending workers' compensation claim is consistent with the goal of handling claims efficiently and avoiding duplication of efforts." "......a rule barring a hospital and medical group from bringing a common law collection action against an employee who enters into a settlement without providing for payment of medical bills is inconsistent with public policy and notions of fairness. A requirement that medical providers intervene or file a claim petition in every pending workers' compensation proceeding in order to protect their contractual right to payment will entail additional collection costs for medical providers that will likely result in higher costs for patient care, and may also have the unintended effect of discouraging medical providers from providing care for injured employees. Such a result would be inconsistent with the broad remedial objectives of the Workers' Compensation Act." Id. In 2010 The Late, Judge Virginia M. Dietrich, chaired The Task Force on Medical Provider Claims. One of the issues highlight was that of "Balance Billing." The Medical Provider Claim Taskforce I concluded that such practice was unlawful and legislation was proposed to codify the halt to such practices. The legislation was enacted 11/19/2012 Approved P.L.2012, c.67, NJSA 34:15-15. "New Jersey could take a lesson from other, bigger, states that have already dealt with this issue. Texas long ago adopted not only a medical fee schedule but an out of court, nearly binding medical bill dispute resolution process separate and apart from the claimant's case in chief." Russell Wojtenko, Jr., Director/Chief Judge of the New Jersey Division of Workers' Compensation, reported at the NJ State Bar Association’s recent Spring 2017 meeting that the number of medical provider claims being filed has increased exponentially. A new cottage industry has emerged that purchases disputed medical claims and seeks to advance those claims for recovery in the NJ Division of Workers’ Compensation. Medical Provider Claims [MPC] has become an emerging revenue center for such litigation firms. Disputed medical bills in workers’ compensation are a tremendous burden on the system and all stakeholders. The injured workers are confronted by physicians who are reluctant to provide treatment as their medical bills will be potentially disputed and undergo costly and uncertainty of litigation. Claimant's attorneys are slowed in the process of advancing the injured workers’ claim toward resolution because of the dilatory and ambiguous calculation process involved in medical fee disputes. Employers and insurance companies face additional litigation costs defending medical fee disputes and are stymied in attempting to settle claims. The Division of Workers’ Compensation confronted with escalating medical fee claims established Medical Fee Task Force II. Their proposed guidelines (see below). Drafted in 2015, the Guidelines have yet to be enacted. At a recent academic seminar, NJ ICLE Hot Topics in Workers’ Compensation Law 2017, there was discussion over the urgent need to take action to address the concerns of medical fee claims as well as several other proposals advanced by the NJ State Bar Association including procedural efficiency and the tenure of Judges of Compensation. It is essential that the integrity of the workers’ compensation system is preserved. The system is social legislation that is remedial in nature. It is one that affords certainty of results and expeditious resolution of claims in a summary fashion. MPCs need greater regulation both administratively and substantively so that MPCs do not emaciate the entire compensation benefit system. The proposed Guidelines for Medical Claims are a valuable approach that should receive immediate attention. For over 4 decades theLaw Offices of Jon L Gelman 1.973.696.7900 jon@gelmans.com has been representing injured workers and their families who have suffered occupational accidents and illnesses. N.J.S.A. 34:15-15 states in relevant part: All fees and other charges for such physicians' and surgeons' treatment and hospital treatment shall be reasonable and based upon the usual fees and charges which prevail in the same community for similar physicians', surgeons' and hospital services. The purpose of these Guidelines that follow is to institute uniform and consistent hearing processes for Medical Provider Claims ("MPC") in the Division of Workers Compensation. These guidelines are proposed supplements to Subchapter 3 of the Division Rules, specifically Rule 12:235-3. l, Initial Pleadings, Rule 12:235-3.8, Discovery, Rule 12:235-3.11, Pre-trial Conference and Rule: 12:235-3.12, Conduct of Formal Hearings. 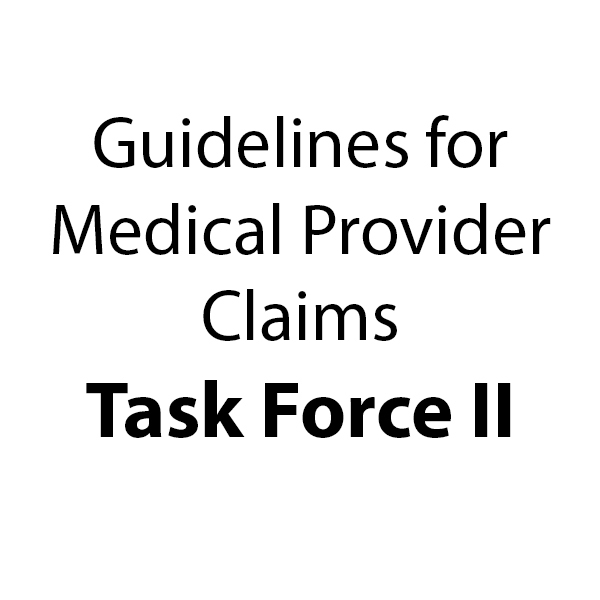 The Medical Provider Task Force believes that these Guidelines, which are intended to assist judges, will also inform litigants of the essential evidence to be gathered and produced for consideration by the court. Adherence to the proposed discovery and pre-trial processes will ensure that the litigants meet their respective burdens of proof and that Division Judges properly receive the necessary evidence for them to execute their responsibilities under the Act, N.J.S.A.34:15-1 et seq. 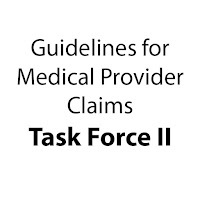 The Guidelines, which are mindful of the findings and recommendations of the 2010 Task Force on Medical Provider Claims, are proposed to supplement the current Division Rules. They should be construed to secure just determinations, simplicity in procedure, fairness in administration and the elimination of unjustifiable expense and delay. Medical Claim by Provider (MPC) Claim Petitions shall be in the form prescribed by the Rules of the Division. MPC petitions shall be verified by the provider and include the date of the signature and verification. 5. The corresponding medical treatment records, Health Insurance Claim Forms (HCFA), Explanations of Benefits or Reimbursements (EOBs or EORs), the type of facility where the procedure was performed, and an explanation of how the provider derived its fee schedule. b. If the Certification and other information in a. above is not filed and served within 15 days of the filing of the MPC, the Respondent/Carrier shall file a Motion to Dismiss same. 3. Any other proofs in support of its position that usual and customary charges were or were not paid by the carrier or its agents. c. The parties may propound and exchange MPC Interrogatories within 30 days of the filing of Respondent's Answer. Answers to Interrogatories shall be served within 60 days of their receipt. d. Discovery may be extended or expanded by the court with the consent of the parties, or by Order upon good cause shown. e. The parties shall file with the Court data points or evidence of UCR payments showing paid amounts for each CPT Code at issue. These data points are not to be limited, but may include reimbursements for the relevant codes made under the following: Fair Health Allowed Module, New Jersey Personal Injury Protection Fee Statute, Provider/Carrier/Commercial Payments, CMS, Wasserman, the Pennsylvania Workers' Compensation Fee Schedule, the New York Workers' Compensation Fee Schedule, Federal Workers' Compensation Fee Schedule and any other probative evidence of paid charges received by the provider or paid by the carrier. The court shall consider payments allowed under these schedules to represent the range of reasonableness for determining UCR under the Act. a. At the Pretrial Conference, the Judge of Compensation to whom the case is assigned shall review the above submissions by the Provider and the Respondent. The Judge of Compensation shall take note of missing proofs and permit the Applicant and Respondent to supplement the above proofs within a reasonable amount of time. If the proofs are not provided within the time period ordered by the Court, the Respondent may request a "Not Moved'' marking from the Court. Such a marking will be within the discretion of the Court. If either party fails to provide the required proofs as ordered by the court, the aggrieved party may file a Motion to preclude prosecution of a claim or to suppress defenses. b. At the completion of the discovery period as set forth above, or as extended by the trial judge, the court will conduct a Pre-trial Conference for the purpose of identifying and narrowing any outstanding issues for trial. c. At the Pre-Trial Conference, the Medical Provider shall identify with specificity the relief sought and the factual or legal basis for its claims. The Respondent shall likewise identify its defenses to the Provider's claims. All documents to be submitted at trial will be exchanged no less than one cycle prior to execution of a Pre-trial Memorandum. 1. Evidence of Charges, Payments and UCR Data Points. The Parties shall produce a chart establishing the Provider's charges, the Respondent's payments, and the applicable and relevant reimbursements pursuant to: the New Jersey Personal Injury Protection Fee Schedule CMS, Wasserman Fee Schedule, Fair Health Allowed Module, Pennsylvania Workers' Compensation Fee Schedule, New York Workers' Compensation Fee Schedule, and Federal Workers' Compensation Fee Schedule. The court shall consider payments allowed under these schedules to represent the range of reasonableness for determining UCR under the Act. 2. Any other relevant evidence of the charges and reimbursements the parties intend to produce in support of its claims or defenses. (c) The documents, witnesses, or other evidence that Provider intends to offer in evidence to satisfy its burden of proof that its charges are reasonable and based upon the usual fees and charges which prevail in the same community for similar services, and that demonstrate that Respondent's reimbursements were not based upon the usual fees and charges which prevail in the same community for similar services. (b) The documents, witnesses or other evidence that the Respondent intends to offer to in support of its position that the reimbursements made to the Provider were reasonable and based upon the usual fees and charges which prevail in the same community for similar services. 3. Documents. Non-expert documentation by either party may be admitted by consent of the parties and approval by the trial judge, or otherwise, must qualify as a business record under the New Jersey Rules of Evidence. 4. Non-expert witnesses. The parties will identify non-expert witnesses and the subject of their testimony.